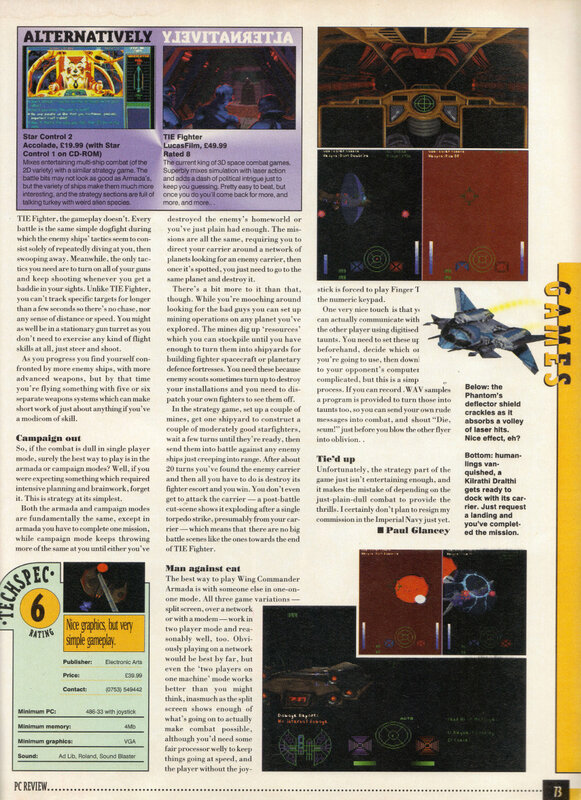 This is taken from November 1994’s PC Review magazine. This is a game I haven’t played in years but I did play a bit when it came out. 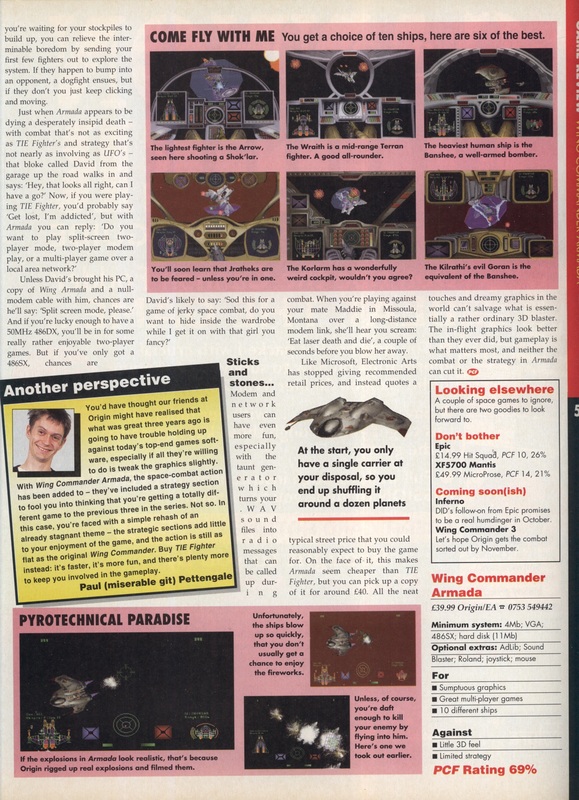 I would assume it was aimed to fill the gap between Wing Commander 2 and 3 and address the issues with Wing Commander Academy. Academy was a pointless game really, I’m hoping for better with this. Armada uses Strike Commanders realspace engine to present the Wing Commander universe in full 3D for the first time. Instead of a new storyline it adds a strategy element to the game. You can play as either Kilrathi or Confed and the manual does a great job of presenting the history of the war from both sides. The intro shows a very brief dogfight. Its nice enough but only lasts about 30 seconds. Before jumping into the strategy game I have a quick go at the gauntlet mode which makes a not especially welcome return from Wing Commander Academy. Once again this is 15 levels with 3 waves of fighters each time. There is no way I’m attempting this but it gives me a first look at the new engine. It has to be said that the graphics in this are very very nice for the time. The fully textured ships look about as good as they could in 320×200 and the 3d shield effects are especially nice. 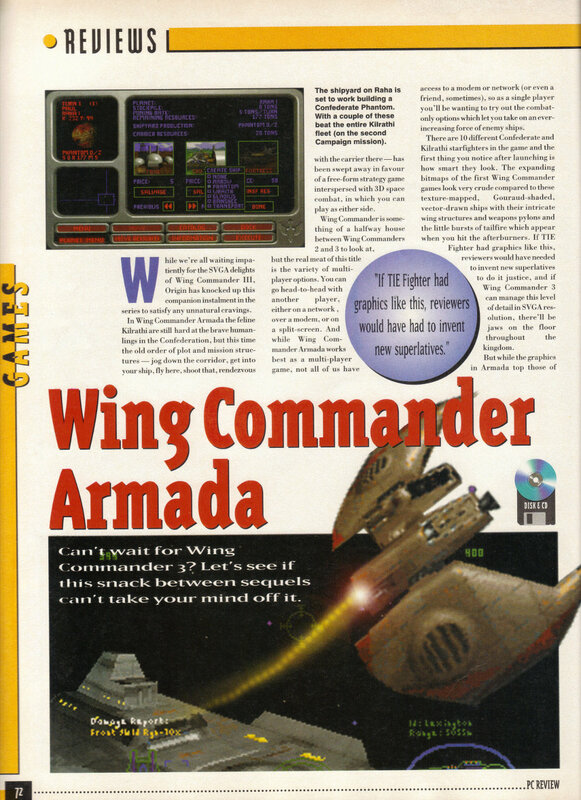 If you could only run Wing Commander 3 in VGA (which applied to me back then) this was actually the better looking engine. I get bored of gauntlet very quickly and have a go at the campaign mode which is the biggest of the game types available. It consists of 11 sectors which have to be fought out – you are scored each time and the winner at the end gets to blow up the enemy home world. The strategy part of the game consists of building mines & shipyards on planets. Planets have varying resources which you can mine either quickly and wastefully or slowly and efficiently. Resources also may need moving around using your carrier or a transport so shipyards have the material to build ships. You can build shipyards on any planet to create fighters. Bigger fighters take more resource and time to build so this also needs balancing. There are 6 fighters per side + transports. The potential is there for a quite complex strategy game. You can only see opposition that are within 1 jump of one of your ships. The same goes for jump points so you have to gradually explore each system to try to locate the enemy. If you encounter enemy forces you get to fight the battle out. The combat certainly looks great but the enemy a.i. is really poor – they end up just flying circles and a dogfight consists of flying the same turn over and over again. I’m never in any danger of being hit nevermind killed after the initial exchange. The strategy a.i. isn’t a whole lot better – the computer never builds anything other than the 2 most basic ships neither of which is capable of destroying my carrier. My strategy is just to build a few of the toughest ships and explore with them – I can win any combat with these no matter what + they have torpedos to take out the carrier. When I find the carrier I just have to move a banshee onto its system and the cutscene kicks in. We get scored on this and there are another 10 systems to go. I play through a few of these properly taking my time but the game starts to get old very quickly and I use the quick combat option in the menu. This allows the computer to calculate the result of a fight so I don’t have to fly it. I can win any level by creating two banshees asap, docking them with my carrier, then just sending my carrier around the map until I find the enemy. This tactic is infallible and is barely even complex enough to be a tactic. Once I start doing this I can pick off each system in minutes. After 11 systems, I get to blow up Kilrah in a very disappointing fmv that lasts approximately 2 seconds. I can’t really call the game completed until I do the same with the Kilrathi ships. All the cutscenes are mirror images of the Confed ones with the ships changed. The ships are very much mirror images of the confed ones also although again I just used the heaviest fighter. That theoretically finishes off this game. It has to be said that I wasn’t massively impressed. The potential was there and the engine looks truly awesome. The strategy game was complex enough to be interesting as well – it was really let down by the a.i. It has to be said that the game did offer the option of multiplayer and judging by the poor single player option that must have been where it was aimed. I remember playing a few games back in my student days over a null modem and it was pretty good fun but not as much as you might have expected. 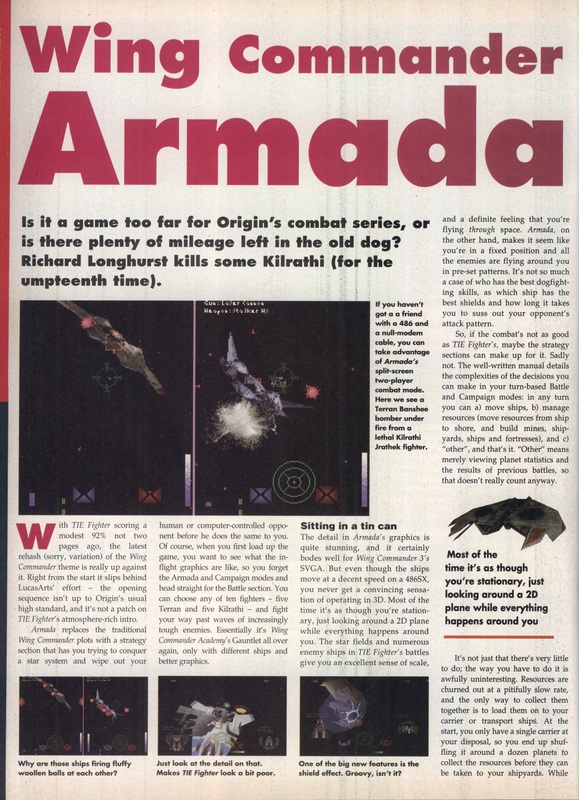 When you fight a human opponent you become very aware that combat tactics in Wing Commander are basically turn towards the enemy as quick as you can, shoot until they go past you and repeat. Combat was often a series of chicken runs. You also tend to end up fighting with and against the same ships over and over again. The tactics came far more into play though and the other ships became more of a real option. I’ve not even flown most of them here. All in all its not a great game but it wasnt a bad attempt with multiplayer games few are far between back in those days. The engine deserved better though and it does have an unfinished feel about it, like it should have been worked on for a few more months. As a single player experience the most entertaining thing about it, I’m sorry to say, was reading the manual.